Browsing the archives for the The Netherlands tag. 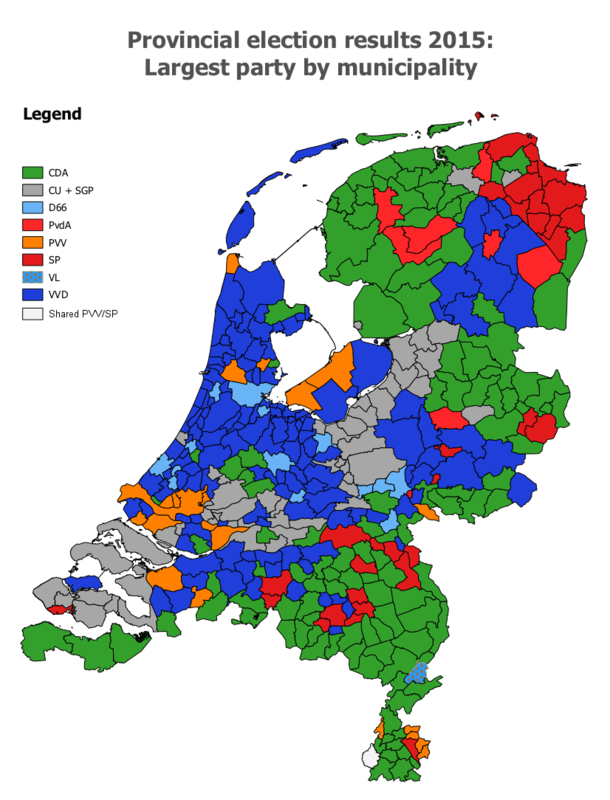 Update: see also this post about the provincial elections of 2015 in the Netherlands – it has better maps and dives into some electoral history as well. It’s not easy for local elections in a country the size of The Netherlands to make the international news. But if there’s anyone who can make it happen, it’s the peroxide-blonde leader of the Dutch far right Freedom Party, Geert Wilders. And that’s what he did, on March 19, when the municipal election results were being tallied. Orating to a Freedom Party rally in The Hague, Wilders asked his supporters to give “a clear answer” to three questions that he was going to ask them; three questions that “defined our party”. “Do you want more or less European Union?”, he started off. Less, less, his supporters chanted enthusiastically. Second question: “Do you want more or less Labour Party?” Again, the crowd clapped and chanted: “less, less!”. So Wilders moved on to the third question. “I’m really not allowed to say this,” he started, but “freedom of expression is a great value … so I ask you, do you want more or fewer Moroccans, in this city and in the Netherlands?” The crowd, elated, chanted back: “Fewer, fewer, fewer!”, and with a sly little smile Wilders remarked, “then we’ll go and arrange that”. Which got the Dutch election night headline space from the BBC to The Guardian, from the Times of Israel to Al-Jazeera, and from Fox News to the Huffington Post. All of which was pretty unfair, considering that Wilders’ Freedom Party (or the PVV, as the Dutch call it) had been something of a non-entity in the whole local elections campaign. The party had refrained from taking part in the elections altogether in all but two municipalities: The Hague, the seat of the Dutch government, and Almere, a large town in Amsterdam’s commuter belt. Moreover, as was mentioned in almost none of these stories, it actually lost votes in both cities.